If you have interior decorating questions, we have answers! Submit a question through the comment form below and one of our home improvement professionals will write a post to address your dilemma! Click here to discover answers to your questions. My friends have been telling me for years that I should look into becoming an interior decorator. Decorating my house (and said friends houses, when asked) has always been an enjoyable hobby of mine, and I guess you could say I have a knack for it, but I’ve always looked at it as simply that – just a hobby – and not something I’d do full-time. However, I recently lost my job and am looking to take my life/career in a different direction. I’d love to consider a career as an interior decorator, but I don’t know the first thing about getting started. Can you offer any suggestions or guidance? I have a living room and a game room area that share a fireplace. Should I take down the walls around the fireplace or leave them as they are currently? Fireplace can be great focal point in your room. However, if you already have other focal point and it’s more necessary for you; i.e. big screen TV or large art works, it would be more work when you take a fire place down. My kitchen has a high vaulted ceiling which requires a support pole from floor to ceiling, The pole is at the end of the island and is centered in the kitchen. The builder boxed the pole with simple stained lumber. There is not an option but to live with the support pole, do you have any idea of what can be done with this pole to make it more attractive in the space? You can easily put up a wall divider. However, the wall divider does not necessarily have to be a screen. You can put up a large shelf that can be used for your bedroom area and your living area. A wall divider that is a shelving unit for both areas. Hey, I have many plants including cacti that I plant outside in the summer, but struggle to find a place to fit them inside during the winter. When I do its pretty ugly. Any ideas for indoor arrangements that provide light and visual appeal in a small space? I need color help. Our dining room and living room are wide open to each other. The dining room has brick red walls with dark wood furniture. The living room has medium brown sofas. What colors can I use for spring accents? I live in an apartment where the landlord does not allow tentants to paint the walls. My question is how can i give the illision that my wall(s) are painted but im on a small budget and it would have to be an inexspensive way to do so. I am moving into my dream home. It is an oceanfront Florida condo. The main room is approx 26×15 wide. I am going for modern and classy. My ? Is: is it a good idea(will it look upscale/classy) if I paint the long unbroken wall a metallic sheened silver, and then can I do the opposite wall a metallically sheened blue/green? Also, this move is putting us on the ‘eat beans’ budget; therefore, cannot afford drapes. It has lovely damask draperies with swags and jaboted, but the colors of the stripes do not go. Have you heard of anyone painting over damask with fabric paint? Are there lovelier options? My new apartment has medium chocolate brown carpet… how can I break up the brown ? I was planning on getting furniture with a medium cherry finish, will that look good against the brown? Any ideas and suggestions would be great. I am redoing my bathroom. Is it essential for bathroom vanities to match? I assume I could decorate without a tree but somehow it does not seem the same. I am thinking about painting a room with a chair rail. I want to use a biege color and a complimenting contrast color. Which would be more appropriate – the light color or the darker color below the chari rail? I was wondering if one can affix curtain rods close to the ceiling and display curtains that only hang about 3/4 down the wall once placed on the rod; or with this rod height, must the curtains be full length to the floor or it will look funny/cheap or chop the room height? Im building a new home. The kitchen has an open floor plan with a large bar seperating it from the living room. Cabinets will be stained a dark mahogany, flooring is the brick cement flooring in used red 4×8 and back splash is the same color brick in 2×8. I will have a large island that I was thinking would look good painted instead of stained. My husband wants black galaxy granite countertop, im thinking a dark grey would look best, along with painting the island a distressed grey. Im worried that the dark cabinets along with a black granite countertop will make it too dark. What do you suggest. We are moving into our new home that was last decorated back in the eighties with lots of light pink flowery wallpaper, neutral carpet, brass fixtures, some tan tile and barely off white (maybe just dirty) drapes. I want to strip the wall paper and add color. And I want to paint or replace the brass fixtures. The carpet will stay for a while as will the tile. Can I do a dark grey on the walls? Or will the grey look bad with the tan carpet and tile nearby? Can I do grey and pink in one room and tan and white in the next room or do I need to pick one ( tan or grey) and keep it thourout the house? I need to replace my kitchen faucet as it beyond repair. In my kitchen, I have black Soapstone counter tops and a stainless steel sink. I originally put in a stainless silver “satin” finish faucet, but it never really matched just right, as the sink was always a tad lighter, but a darker silver finish would have been too dark. I’m thinking of putting in an antique style, black “stain” finish faucet and soap dispenser. All the appliances are stainless steel. The only black in the kitchen are in the ridges of the cabinets and the black soapstone counter tops. I’d like to know if it’s “acceptable” to put a black faucet and soap dispenser on a silver stainless sink? I’m putting my house on the market this summer, so I don’t want to replace the entire sink, by I’d like give the kitchen a little “pop”, as my kitchen is looking a little too gray and could use a little contrast. Thank you so much for your help and I LOVE your website ! Hi, We have lived in our current house for awhile and life has been busy. I have more time now to think about fixing some things that have been bugging me. On is the echo and look of our two story family room. The house is very open and we have installed blinds on the lower windows and are looking to install blinds on the upper windows because of the sun. However, my question revolves around drapes for the windows. There are 4 sets, two on the back wall on either side of a fireplace and two on the outside walls to either side. We have gone back and forth about if the drapes should be only one story or both stories. The windows are lined up one over the other so this is an option. I was also wondering if they should be double width panels or single since there are blinds underneath already for privacy? I’d like to hang mini-chandeliers on either side of queen bed in a room which has ceiling fan w/light above the bed (center of room). Will chandeliers look silly with fan? My living room is 14×14, I have white walls and burgundy carpet with burgundy pulled back curtains with white lace also have a burgundy recliner. My question is I would like to buy slipcovers for my love seat and sofa. I really like the Lexington floral print ( Sure fit by Wayfair)- with burgundy flowers. I also have plain burgundy pillows to go on each – 4 for sofa and 2 for loveseat. But I’m really not sure. We have 3 grandsons and one on the way . And 2 big dogs. So I thought with the prints it would hide just about everything. I’ve tried solid burgundy slipcovers before but it was just to much. I love the color burgundy, All of the rooms have a touch of it in them. What do you think? hello, i have no knack for decorating…. I have a charcoal colored couch and berry colored chairs. my curtains are ivory with a grey pattern. my floors are wood. My wall are white now but i want to paint. I was thinking a pale greay but is that to much grey, a pale purple. blue. i have no idea. Any advice on paint color would be great. I am redecorating my bedroom. I have a charcoal shag rug in the bedroom area and want to put a gray wool rug with a sparkler design in the sitting area. The wool rug has bursts of orange, soft blue and cream. Will the two rug materials go together? BTW, the closest we even came to divorce was wallpapering the stairway in our first house 35 years ago so that’s not an option. I have a wood wall in my bedroom & all of the other walls are white with white molding. Not sure what I should do with them. Some suggestions have been, leave the walls white & continue the wood around the molding through out the whole room or around the one wall. Paint the walls a light shade that matches the wood. I can’t decide! Do you have any recommendations? The wood wall has a window in it with white vertical blinds which I was thinking about changing too, if you can make a suggestion. hey Jill – your question has been answered! I currently want to be an interior decorator(not an interior designer) and the college that I want to go to only offers interior designing programs. Should I take it or just take other classes? I am redoing my bedroom after the passing of my husband. My color scheme is navy, silver/gray with pops of orange. The room has beige carpet but I want to add some color by using an area rug. Can I put an area rug over the carpet and if so any suggestions? My comforter is navy with silver/gray leaves (I have orange throw pillows on the bed and an orange throw draped over a gray fabric chair), the curtains are gray, my lamps have gray shades, and the walls are a sky blue. I so want a patterned orange rug to give my room the WOW factor. Help! Hi there. I live in an apartment with a balcony that I would love to use. However, it overlooks the alley between my building and the next one, and is nearly right above some dumpters. Any tips for a way to hide the eyesore without blocking out all the light? I have an open floor plan with a big kitchen with lighting over an island and a dining area together. There’s a cut out from the living room that you can see into the kitchen. My question is should all my light fixtures be the same color from the living rm ceiling fan to the light over the island and the dining rm table. can I mix a large wall of photographs with color and black and white photos? I have an old rock fireplace built in the 70s. What can I do to modernize it without the cost of replacing? Should I paint it? What are some other ideas? Thank you. My entrance hallway, LR and dining area are all one open space in my NY apartment. The colors are burgundy, pale green, black and yellow with an Aubusson rug in the LR. I would like to paint all three areas and make it a bit more modern. (Right now it’s Ralph Lauren with a mix of French). I have a lamp in my living room that can be filled with marbles, stones, etc. My accent colors are gold, “eggplant” purple, and pale blue. What substance could I use that is somewhat unusual? The walls are pale yellow and the rest of the room is a netural beige. I am trying to bring in as much color as I can without having a circus theme. Thanks. We have done an entire house remodel and are down to buying doorknobs for the doors. We have a knotty alder front door with oil rubbed bronze handle. We plan to use the same type handle for other exterior doors, but do interior doors need to be oil rubbed bronze? Or could we use brushed nickel finish? I am a student who just moved into an apartment. I have a bookcase, a wide dresser, a queen size bed, a night stand, a chair and lamps of course. I have no idea how to position my furniture. In the picture, I have the room on the left. THe window is smaller and pushed to the left. My cable connector is on the wall adjacent to the wall with the window so I planned to put my dresser there and have it double as a tv stand. I have no idea where to put everything else. I want my room comfortable and functional and I don’t have a headboard or footboard. Our office/craft room will be turned into a nursery when the time comes. It is painted a deep blue on two walls and a lighter blue on the other two. I would like to keep the dark blue (its gorgeous) even tho its not very “babyish” and i would be painting over the light blue. What are some colors that would coordinate with the dark blue but also make the room more kid friendly? boy or girl… Also on two walls there is paneling halfway up. Thank you! If redecorating bathrooms, using granite for countertops, should you go with the same pattern and design granite for every bathroom? I chose a granite that has real movement in it. Do I have to watch what type of laying pattern I choose for the tile. I am worried if it is a busy granite that a herringbone pattern might be too busy. How much do I need to make sure they are okay. Is it “permissible” to hang a large mirror opposite another large mirror in the same room? I have inherited a beautiful ghesso mirror and want to put it on a wall that is opposite and just off center from another large, black antique-looking mirror. My friend says 2 mirrors should not be opposite from one another but I don’t have more wall space. The room is eclectic–antiques, traditional and contemporary. the butlers pantry doors are glass. The exterior cabinets are being finished in a dark brown. Should the interior of the cabinet also be brown since it will be visible through the glass doors? The existing interior is a pale oak . I have seen brown cabinets with a light wood interior. Which is more impactful for a butlers pantry that will have crystal and fine china in the cabinets that will be visible.? Hi, I have a question, I painted my light oak trim and doors in my entryway white, also replaced the trim to match. I liked it so well that I decided to do my main living, dining and kitchen area the same. These spaces are on two seperate floors. I painted the trim of one of my bay windows the same white trim color and I am not liking it, the issue I am having is my ivory leather couch and kitchen chairs are fighting with the pure white trim. The furniture now appears dirty to me. Should I opt for an ivory trim color or stick with the same white? Thank you so much. I am currently trying to decide on a color scheme for my new house (we are currently awaiting our closing, photos will be difficult. But I have included a DaVinci-caliber drawing). I am a neutral type of gal and will most likely be sticking to these types of colors. It was suggested to me that I begin with the master bedroom and take my time with the other rooms. So my questions for the: MASTER BEDROOM (a 10′x13′ room. All measurements were taken by my husband and may not be accurate. Sometimes he used the tape measure and sometimes he eyeballed it.) are: 1) since the room is small should I go with white ceilings that match the trim (probably white dove by BM) or since I am leaning towards revere Pewter by BM for the wall should I use a lower percentage of revere on the ceiling. I have read several places where this actually makes a small room look bigger. If this is true, 2) what percentage do you use to get this result. My furniture is a Cabernet color and the window treatment, rug and decorative pillow will incorporate silver/grayish/blue. The area rug would most likely be a light beige color (no pattern), and the window coverings would incorporate some kind of pattern as would the pillows. For the LIVING ROOM (12′x16′): I was also thinking of Revere Pewter, with grays/yellowish pattern as part of decor. For the DINING ROOM and KITCHEN (no measurements): My husband put in his two cents and wants green in the kitchen and dining room. I don’t mind green, but I don’t of a green that is neutral and light enough to blend in with the revere and beige of the living and family rooms. Also, I worry that this could make everything look choppy going from one color to the next like that. So what do you think of my color scheme? Are my choices of revere pewter and either shaker or greenbrier okay? Any suggestions on green for dining/kitchen? I’m in dire need of some color palette advice. I’m re-doing my living room and painting an accent wall a light aqua. I have a white couch, grey coffee table and the rest of my furniture (media stand, side tables) are black. My plan was to have yellow throw pillows but I don’t think it will look very good to have all 4-5 pillows in yellow and so I feel I need another color thrown in but am at a loss as to what color would be best. Adding grey into the pillows I fear will be too much as my coffee table (which is rather large) and my picture frames on the walls are already grey. What do you suggest? I am going to move to my in-law’s house and will be living in a one bedroom with my husband and 10 month old baby. I am not sure how to organize it to an efficient space. it is a very very large room with an en suite. so i would like to fit a small seating area as well as a coffee corner. I had to tear up my hardwood floors, and because the wood is still good, I thought I would reuse the flooring as wall decor in my garage. I think it would look good with all the walls covered, or just one (but then I’d still have a lot of left over wood). Have you seen this done before? The flooring is finished red oak, has a lighter shade to it. Seems like it would class up the garage a lot, and put this second hand wood to good use. p.s. I can’t decide to lay the wood vertically or horizontally, it seems natural to do it horizontally, but then again I’ve never seen this. My husband and I are moving into a new home soon. There is a large open living room / dinning room area which has a brick fireplace, and a dark brown wood mantel and some built in bookshelves around the fireplace. The wood floors are stained a very dark brown. The sellers, in getting ready to sell, have just recently painted the walls a yellow-ish creme color and all of the trim (baseboards and window trim) dark brown (similar to the floors). My husband and I don’t love the look as it’s very dark. However, we recognize that it was just recently painted and the choice of brown paint seems to be a conscious decision to go with the built ins and mantel. We don’t like painting over wood as a general practice. (The mantel is actually really pretty, we don’t want to white wash it.) However, we both love the look of white baseboards and how that lightens up a room. And to make things more complicated, we have blue leather couches which we also like a lot. Is there a wall paint color that could go with the blue couches, the dark brown hard wood floors, the dark brown wood mantel and built ins, but also work with white trim and baseboards? We just installed wood floors in our dining room. is an area rug necessary for under the dining table. how do we determine the right size rug? i have a very small boxy living room. long shuttered window on two walls, a fire place on one of those walls and a dark chocolate leather sofa that has chaise lounge attached. The floor is light laminate wood. Now the couch is against the walls with no windows and takes up almost one wall and a half ( if you can picture this). I use about 4 mirrors to make it appear bigger. All have chocolate wood frames. Three on the wall with the couch and one large one above the fire place. I want to do an accent wall in dark brown or add a white color to make the room look larger. It has to be something simple. Presently I have beige coco colored walls and all the window, fireplace and door are in white. I need your help before I decide. Please advise. Thank you. Hi, I have a clean slate to work with. I am decorating my entire bedroom for the first time and I am 55! Don’t ask. I am getting everything from top to bottom. I have just picked out our bed. I have a 19 x 20 bedroom. All the magazines and decorators (and me) feel you should not buy a full set of bedroom furniture. But no one is giving any advice on what pieces should match the bed or each other, if any? There is no advice on the internet if you should match the bed, dresser and mirror. Should the dresser match the mirror? Should the dresser match the chest of drawers? Should either of those match the bed? Should we buy at least one nightstand that matches the bed? Should anything match the bed? Not into a bohemian look, I just like an eclectic look. If you choose a matching chest of drawers, should the dresser be different? If I could just get through this critical question I would feel so much more confident about what I am doing. I am shooting for a very elegant bedroom look. I just bought a King from Liberty Furniture-Arbor Place set from Great American Home Store. Thank you so much for answering this for me. I am so grateful for your help!! I am redoing my three bathrooms and while the flooring and walls will be the same… I have picked different vanities and actually vanity styles… one is modern in espresso, one is somewhat country (distressed antique white for my two little girls) and one is traditional in espresso. Is this a decorating faux pas? When hanging pictures in a bed room does the “theme” have to be the same? My 21yr old son collects large stuffed toys[mainly cats and dogs].What desgin would look good as curtains in this room? The walls are painted Dulux St Kilda[a shade of blue] Cat print fabric on the Internet is very juvenile. We moved into a rural home and it is definitely decorated in the country look. My main floor bathroom is a burgundy/white checkered floor, burgundy counter top and maple cabinets. Currently the curtains are burgundy and the walls a light grey. Can you recommend a colour combination for my window(would be a valance) and shower curtain. People have recommended hunter green but as with the country theme my kitchen counter tops8906 and floor are hunter green as well! Help, I live in a apartment and the land lord won’t let me paint kitchen another color. The walls are slate blue color and dark brown cabinets and white appliances. The floor is ugly neutral/tan color. I want to decorate but have no idea what colors to use that will go with this. It’s a small kitchen too. Please, help me. What colors/decor could I go with? We are renting a home that has a half wall with fireplace in it. It juts out from the adjoining wall and separates the dining room and living room. The top of it needs to be decorated but I am at a loss. It almost needs something with height and needs to be attractive from both sides of the room. I thought of starting with a lamp but the cord would not be attractive. Any ideas? And this one is the wall opposite of the window. Isn’t it better to have that board rather reaching the ceiling? What would you advice me to do, how do you think would be best to put these boards in that room? My living room is basically 29′x16′ with two square entrances. I have a blue slate top (it does have a bit of green -subtle) and cream marble bottom fireplace surround. My furniture is green leather and cloth (purchased from Walter E Smithe). I’m at a crossroads. I need a wall color and carpet color. The ceiling has exposed dark wood beams 10′ ceiling. The window treatments are wheat color drapes and cream color sheers on one side of the room and the other side (adjacent and centered wall) has wheat colored roman shades. How do I make the fireplace work with wall and carpet colors and trim. Please help. Tears are flowing. Please help me….. I recently bought a tufted headboard online, it was supposed to be grey, but up against my white sheets and grey walls it has a very strong teal undertone coming out. I am wondering if there is a color I can use to offset the teal in the headboard and make it look less teal and more grey. I am thinking of putting wallpaper behind the bed, and using accent pillows and a throw- but I dont want to pick the wrong color that will go horribly with my teal/grey headboard. Any ideas will help me greatly!!!! !Thank you! I recently moved into a house with a pink walled bedroom and dark red carpets. I painted the walls a cream color, but I’m not sure what to do about decorating ideas. Worse, the walls take on a green tint now because of the lawn outside. Do you have any suggestions? My bedroom is a long rectangle with a window on one end and the closet and entrance on the other. Hi, I hope you can offer some advice. I’m re-doing my living room, I love bright canary yellow cushions, soft furnishings and accessories, but as far as I can tell they match best with grey furniture, but I really don’t want grey. I’d like a neutral though – I like beiges but feel that doesn’t work with yellow. Any tips as to how I can incorporate lovely bright yellows, but without using greys, would be very welcome! Hello! I was curious about window treatments on small windows. Both of my bathroom windows are small. Currently they don’t have anything on them. Do you recommend dressing all windows or is it ok to leave some bare? Thanks! We’re moving into an apartment with pretty atrocious bathrooms; mustard yellow tiles and matching toilet, sink, and tub, and yellow/brown tiles. 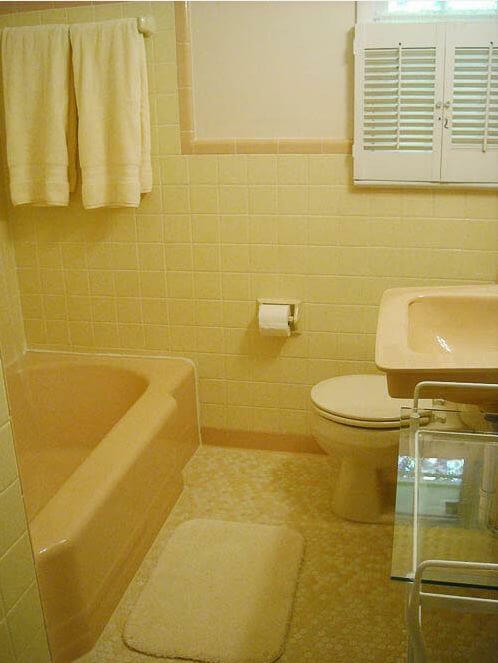 Similar to this, only more mustard and far uglier: http://retrorenovation.com/wp-content/uploads/2012/10/margie.jpg. We can’t change the bathroom or spend a lot of $, so what would your advice be concerning bath matts, shower curtains, towels, etc, to make this bathroom less ugly? I was thinking perhaps green/bamboo to make it seem “nature”-y, or perhaps do something to give it a foreign flare, but I thought it’d be better to ask a professional! I just bought a sofa which isn’t leather but has the soft look of leather. I need another chair in my living room. do I have to get the same leather look material or can I go with a fun print cloth chair? Should I choose white cabinets or antique white cabinets? I have a customer with a long slender window up near the ceiling. It’s centered on the wall, but the problem is that about 8 inches of it runs over the tub area, which prevents me from installing a rod (up high) for a shower curtain (with plastic liner). What to do? Homeowners want guests to have the option of showering. I may have made the biggest mistake of my life. I hope you can help me! A little while ago, on a TV show I saw a white room with teal curtains. It was beautiful. Very beachy looking. I then found some sheer voile panels 60″x84″ on sale. I bought them ! At this time my husband and I were just starting to remodel our kitchen, dinning room, and living room into an open concept style. The room is not yet finished, but I am having second thoughts. Or a least second guessing myself. The room is huge. It has nine windows (yes nine) in it. On any TV design show, or any magazine I’ve looked at, the curtains are never the main source of color. Have I made the biggest and most expensive mistake of my life? I would love an experts opinion. I’m remodeling my bathroom in a small cape cod, converting the tub to shower. I do most decorating in neutral tones but want something different. I’m thinking dark charcoal shower pan, slate like tile in shower, clear shower doors, bisque toilet, vanity undermount sink bisque, the vanity top dark quartz to match the shower pan, and the vanity cabinet bisque or oyster. Walls a soft gray, brushed nickle plumbing fixtures, baseboards and trim bisque. Towels and accent can be just about anything but I’m leaning toward teal or gray blue. My big concern is the shower being such a dark space and out of balance. The vanity top is about 42 inches of dark to balance but is it enough? I have 2 lamps with goat skin shades in a room. Should a third lamp have the same kind of shade? We are painting our kitchen walls a BM glass slipper & our cabinets BM dove wing. We want the ceiling color to be different from the trim work so it pops. Does anyone have suggestions for trim & ceiling color? We had talked about glass slipper at 50% for ceiling & possibly using dove wing on trim work as well (the trim work is flush against kitchen cabinets b/c the cabinets go to the ceiling), but there’s not enough difference. Any suggestions are appreciated!! I am planning to give my master bedroom a slight makeover. Paint, bedding, lamps, rug but, I will not be replacing the furniture just yet (one more move to make). I know I want a cozy, almost a hotel room style with nice white linens/bedding, something clean and comforting. The wall paint I have is mushroom cap, a nice soft grey/taupe color not too dark not too light. The problem is this…my husband’s father hand built the furniture (headboard and dresser with mirror) and he will not let me paint or change them in any way, which understandable. But, I do have to live with it until we make our last move where the pair can be placed in a spare room. The woods do not match- headboard is a lighter ash or oak and the dresser is a little darker more towards a walnut color. The headboard is not as big or substantial as it should be, it has three spires/posts which are small in diameter and not round balls on the tops but more pointy like a teardrop but not as sharp and not very high. The dresser is the opposite, it is chunky and heavy with wood trim and shelves all around the mirror. I am having difficulty in figuring out how to incorporate these two things in the style I am trying to achieve. The different wood tones is not an issue I kind of like that they don’t match. Do you have any ideas how I could hide, shroud, mask or at least enhance the headboard to mirror the chunkiness of the dresser? At least visually? and without permanently marking the original? I am really looking to make the bed the focal point, being comfy with generous pillows, etc. I have thought of hanging pictures or a large painting or something over the bed but, would it look odd if the frames were dark and the headboard light? I am trying to anchor the bed I guess is what I am saying and I need to take some of the focus off of the dresser. Already I know that changing the furniture arrangement will help that but, do you have any other suggestions? Help! The house we rent is a historic home and we are not allowed to change the walls, bookshelves, light fixtures, phones, etc. It was a classic, formal office prior to our use. There is a red velvet and gold foil wallpaper on all four walls down to the medium brown chair rail. We can’t change anything except the curtains. How can we turn this room into a gender neutral nursery? I can send pictures if that helps. Help! I have the most challenging living room ever! 2. To many focal points.. One end is a huge floor to ceiling stone fireplace with hearth and the other end is floor to ceiling mahogany built in bookcases converted to entertainment center. 3. The other 2 walls.. One wall is just a long blank wall with mahogany paneling midway up. 4. On the opposite wall there’s a huge picture window way off center and down by the fireplace end of the room then a small section of blank wall with the same mahogany paneling half way up then another standard size window near the bookcase end of the room … all on the same wall! My question is how in the world am I supposed to arrange furniture that makes any sense at all! What paint colors will play well with all the wood. This room is also trimmed in mahogany and has hard wood floors. I’ve considered painting all the trim and bookcases white to brighten it up and make it feel wider. Right now it feels dark and narrow. Any suggestions would be appreciated! I live in a townhouse and have a nice size living room which I have painted toasted chestnut. My curtains are white with orange in between and my furniture is gray with purple accent pillows. My coffee and end tables are black with glass and my entertainment center is white. All modern furniture. I have one wall, my longest, is my problem child. It’s so boring. I have a stencil which I purchased and want to use on the wall, but I don’t know what color to use. Should I repaint that wall white and use toasted chestnut on the stencil part, or is there a white that is not so “in your face” that would look nice ontop of the toasted chestnut paint. Please help, I’m tired of looking at this boring wall. I am wanting to extend my wood laminated flooring to another room and am having no luck matching it to the existing flooring. How does it look when there is 2 different colors of flooring? I’m trying to choose dining room furniture. My dining room has painted walls, lots of windows/natural light and stained wood trim with an oak color stain. The floor is almost-black slate tile. Should the wood color of the furniture MATCH the stained wood trim in the room? I’m considering the Canadel weathered gray finish, but I’m worried about how it will look with the oak-color trim in the room. Help. In a home with lots of orangey oak woodwork ( trim, doors, cabinets, etc) what warm grey colors on walls or palette would work? I want to paint my kitchen cabinets but am not sure if I should paint them white or a darker color. My kitchen walls are purple which is connected to the living room which has a light brown color. My appliances are stainless steel and my pantry is white. I posted a couple pictures online to get a good idea. Does it add more value to paint the walls in your home same color or different colors for different rooms? I want to get rid of the white walls but should I choose one color throughout my home? Is it ok to have a settee at the end of bed that’s higher than the edge of the bed? My home has an open concept first floor where the entry hall, family room, dining room and kitchen are all visible. I currently have several area rugs of the same pattern/colors in the entry hall, family room and dining room and am trying to decide if I should keep the same rugs available in each of the rooms. It’s time for a change and I’m stuck with knowing what to do for a new look. My chandelier has corner rectangular shades and my bedside lamp is drum shape which I love and don’t want to change…is it ok to have different shapes of lamps in the same room? My decorator selected a drapery fabric with stripes. Vertical stripes were displayed in the sample book but on the back it said in all caps “SHOWN RAILROADED”. We wanted vertical stripes and thinking that was what we were getting I signed a contract with a fabricator (had an A rating on Angie’s list and affiliated with a respected upholsterer). When the drapes arrived the stripes were horizontal. That was when the “shown railroaded” point was noted. My decorator maintains that it was the fabricator’s responsibility to highlight this to me and then determine if thats how I wanted the drapes made. I need to know who should be held accountable for this mistake? I’m buying a foreclosed antique home.The kitchen has black and white checked floor. I hate them, but have to make them work. Cabinets and island is ugly oak and don’t match. The island has a black granite and the side boards have white speckled granite. I want to paint the island cabinets black, because that is where my family (I have 4 boys) will be eating around. The side I wanted white. My sister thinks I should do dark on the bottom and white up top. I will be painting the kitchen walls a pewter color. Can I paint the bottom side board a shade darker then the walls and the top white? Or is that too many colors in one large room? I have stainless dishwashers on the side board. Also, I have brick behind my stove…I hate that too. I want to paint it white, with the red brick it is way to many textures and colors for me. Should I paint the brick, white wash it, or cover it with either white wainscoting or stainless boards? I know it is hard to picture, so I can send you pictures if you want. I just need a little advice. Thank you. Just moved into new apartment. All wall in entire apartment are gold. All rugs throughout apartment are brown tweed. I have a linen look (light) upholstered headboard. I need to purchase a dresser and nightstand but do not know what kind of wood finish to get. Any help would be appreciated. My new curtains are gold and the burgundy color about two feet towards the bottom. My dining room furniture is stained pined, what color should I paint the walls? All my art in my house have picture frames with gold and some are black, will be ok to add another one, but the picture frame is white or do I have to go with gold. It seems that it looks better with white. My husband and I are moving into a bilevel with tons of space. However.. Like most bilevels the upper level is completely open with no separation between spaces or the entry area (which is also connected to downstairs without separation). That being said… I have no idea where to start with painting. Right now everything is white. I don’t mind so much everything being the same color because I can change the accents and what not but when it comes to the entry idk what to do. If we paint it it will lead downstairs also if we don’t then there will be a line where the living room meets the entry. Help? i just moved into a house where the lounge painted light green with green carpet. How can i break this colour up without decorating? I have a friend who is going to buy a harvest table to seat 12. She has a set of 6 matching chairs that are family pieces she wants to use. How would you suggest doing the other 6 chairs? All 6 different, 4 or3 other styles? How would you place them around the table? I think her chairs are oak so would you mix different natural woods and/or painted finishes? Her chairs are rounded back so I am also assuming a different style back. Thank you for you time and suggestions. We moved recently and the master bedroom is small and an odd curved shape. The curved wall has 6 windows and in between the windows is about 22-24 in of drywall. There are blinds on the windows but I want to dress up the room a bit with drapery without making it look smaller. Should I hang valences at the top of each window? Or floor to ceiling drapes between each window? Any help would be appreciated. Hello, I am currently in the process of redecorating my bedroom and have chosen a beautiful paint colour from the Rona Collection called small seduction, which is an amazing shade of dark green. The problem I am having is with finding accent colours that look good with this colour on the walls. Please help me! Thank you. Hi Justin….Home Depot has a great system…you scan your wall colour paint chip….and it suggests co-ordinating colours! I live in an open concept home…with a dark navy paint on the walls…I scanned the chip & the system chose three colours..for my kitchen, front entry & hallway, And each one of the colours happens to be in my decorator cushions on my sofa! Now that is a co-incidence! Hope this helps! (I’m not a designer…but I love the system as Home Depot! Hi, I’m planning on redecorating my room and was wondering if white bedding and walls would look weird with beige carpet? Hello, I am opening an industrial products store and would like to create the industrial look of exposing all the duct work. The original ceiling was a drop ceiling but it needed repairs and installation so a foam insulation was sprayed on it. I would like to paint it black for 1 to cover up any flaws and 2 to have the duct work stand out more. The problem is the ceilings are not that high and i’m not sure if it will make the store seem smaller or the ceilings to look lower. Any advice would be appreciated! Hi. I am currently remodeling our small 7×7 bathroom. We are going for a contemporary styling with 12×24 gray tiles. In the shower the tiles will go all the way to the ceiling. But I am not sure if I should tile the rest of the bathroom walls up to 4ft or should I just paint the rest of the walls? This is a small bathroom and I would love to make the bathroom seem as large as possible. Also, should I use the same tile color and size for the floor and walls? Thank you so much and I would gladly appreciate any info. Hi, I have small bedrooms and my carpets are in aubergine colour. Please advice me on how to decorate my rooms. What colour curtains and bedding and how to make my walls look more stylish? Please suggest what colours go well with aubergine carpets. Re-doing our master bedroom…have chosen black & white toile bedding with black & white buffalo check curtain panels. Our furniture, including four poster bed…is antique white. Two small windows..side by side & mouldings & doors are white. Flooring is maple hardwood. (although not much floor space shows). I’m thinking of going to a very dark grey…to almost a black paint for the walls. I’m not afraid of colours..what are your thoughts on my colour choice? I have just had a new shower tiled is earth tones with small square dark chocolate inlays going around the shower. My faucets, lights and medicine cabinet is oil rubbed bronze. We have a very small bathroom. We are trying to decide the floor and we are looking to do an espresso coffee bean color that has some light colors in it. Would that be ok? I’ve recently finished my degree in Interior design and decoration, and am hoping to begin some freelance design work soon, but I had a few questions about starting my own business that Google is seemly not helping.. if their is anyone who can assist I’d be so grateful. 1. do I pay for the furniture / decor? 2. Do I need my own builder or architect? 3. If I do pay for the furniture and decor do I just do a 20% markup on costs? I have a cape cod style split entry home that is from the 60′s. When people enter the front door, they are sometimes confused about which way to go. The living areas are downstairs while the bedrooms are upstairs, but this isn’t obvious upon entering. When one enters my home, only the hall is visible on the second level, running perpendicular to the entry. I would like to use paint colors on the walls to “lead” the traffic flow down the (winder) stairs from the entry. My thought was to use a warm bright color like yellow on the tall wall leading down the stairs to the living areas and/or painting a “rug” on the hardwood stairs to help pull visitors in the right direction. I would paint the rest of the entry walls and hallway a cooler or less vibrant color. Thank you very much for any help you may offer! When arranging furniture have you Heard of leaving a rest area. I have a corner fireplace next to that I have a large flat screen TV on a stand. Above the fireplace I have a picture hanging of my grandchildren. On the other side of the tv I have a collage of family pictures. I guess my question is have you ever of have a rest area between these items? We plan to remodel our master bath. The bath has a “L” shaped soffit above the vanity which also is “L” shaped. I want to retain the soffit which has spot lights. My wife wants to remove it. she says it is way out of style. She wants spot lights in the ceiling. I actually like the soffit. I also want to save all the work of removing, patching new ceiling and install new lights. We plan to have tile floor and shower, new vanity w/stone top. FYI the house is a very well kept English tudor built in 1976. I’d like your opinion on soffits. Apply drywall tape and spackle or they will keep coming back. I like the regular paper tape, not mesh. I see questions but no answers. where are they? Must of my paint color on walls is like a gold color I am thinking its to much what color can I use with gold. my living room dinning room very close to each other, should I keep it all one color in this area my chairs look like the same colors as wall? my accent colors are blue brown. help! I’m redecorating my family room. Walls are SW straw doll ( soft yellow). I want a light sofa. I have two navy leather recliners I want to replace (possibly with red?) and a club chair and ottoman I want to have recovered. Should I recover the club chair in a print or another solid color? I want to bring teal into this room, but not sure I could go with a teal chair. Suggestions are needed! Thank you! I have some pieces of artwork done by a family member who is a professional artist. His art is all done in water colour and is often of horses and memories he has of Europe as a child. The art I got is very colourful, and fairly large. Each piece is not big enough to hang alone, but still fairly large. My style of home is rustic contemporary with vert neutral colours ( grays, whites, beiges, golds)… How do I incorporate these pieces of art? Can I use them on a gallery walk? What other types of art or photos can I hang with them? I need help with paint colors. Bought a house with mismatched floors and marble tile but want it to flow from room to room. Great room/Kitchen I went with light gray walls and dark stained Hwd floors. Dining room tile is red/orange marble and formal living room floors are lighter marble yellow/beige. My living room furniture is light brown. What colors can I use in DR/LR to match floors, furniture and flow with gray in the great room? Is it weird to have different finished hardware from faucets in a bathroom? I have oil rubbed bronze hardware on my doors and want yo put brushed nickel finished faucets in my bath room. I have one bathroom with white tile and it has one row of black tile with gold trim tiles which I want to remove and expory brushed nickel. I don’t think oil rubbed bronze will like right with the black. The walls in my apartment are painted Grey Birch and the windows are trimmed in gold. The floors are wood. There is a fire place. What color couch do I get for the living room? We just bought a new house and the living room is long and narrow and I am having trouble decorating/arranging furniture. The room is 23 X 11 with a bay window on the west 11 foot end and a patio door on the east 11 foot end. There is a beautiful stone fireplace about 5 feet down the north 23′ wall, entrance from the front hall is at the west end of the south wall and entrance from the kitchen is about 8 feet in from the eat along the south wall. Any help placing furniture would be great!! Thanks so much!! we have purchased a 1500 square foot condo with a fairly open floor plan. we have purchased our dining room chairs and living room furniture in varying shades of grey. what colour should we paint the walls? I am having kitchen remodel issues. My kitchen is very brown. Tongue and groove ceilings and walls,maple cabinetry and brown granite counters. I would like to paint cabinets white, do a white subway tile and then paint the tongue and groove. Do you have color recommendations or does nothing go with brown granite? I also have a bar top that needs to replaced and don’t know if I should try to match granite or do something like a beautiful walnut slab. My kitchen is painted a “granny smith apple” green. My cabinets and counter tops are white. How can I decorate to bring some warmth and welcoming feeling to this room? I have a very nice home, but my entire house has stained crown and floor moulding and has stained windows. I have four beautiful windows that take up most of a large room size den ( 2 on each side). They have ellipiticals above them. I want to put in plantation shutters. I really do not want to paint the stained wood, however, I want to use a Dover white color shutter. Do I need to have the window trim the same color as the shutter? Have you ever seen this! What are your suggestions? My kitchen and living room are the entire back of the house, one great open room. The walls are all the same color and the window treatments are the same. we are looking to install built in cabinets around the fireplace which is the farthest wall from the kitchen. do these cabinets have to be the same color/design/make as the kitchen cabinets? I think it would look bad if the cabinets were close but didn’t match, but we found ones that are completely different in color and design that we like, but are not sure if it would look okay. I have a small 1966 condo with a small dark kitchen and a large oddly shaped living room. I’ve opened the kitchen up and converted half a closet into a peninsula to create a better flow. I have two questions. Second, the original plan was to have one continuous smooth ceiling between the two rooms. To add lighting over the full length of the peninsula we would have have to add a small soffet to the ceiling where the closet used to attach to the ceiling. Will this look too DIY? We bought a house that was a total do. Moved the kitchen and living room and now the living room has a kitchen window. Small like it was above the kitchen sink. What kind of window treatment would you suggest? I’m starting to notice that areas above kitchen cabinets are left bare . Previously, artificial silk plants and art objects were placed on top of the cabinets. Is the bare look the new trend? Also – my kitchen island has black granite as well. I’m not sure if I should paint my island the same color as my walls or a contrasting color. I’m having so much trouble decorating my rental bedroom. The walls are really over crowded. Wall #1 has one window. Wall #2 has two windows on each end, with a mirror in the middle (its actually attached to the wall. So I can’t remove it, there are 3 total of these mirrors in the room) Wall #3 has another mirror and wall #4 has the door and and a closet at each end with ANOTHER mirror in the middle. I just feel like too much is going on and cant figure out what to do. What can I do decorating wise? Can I put my fridge beside the sofa? Or put my tiny dining table behind the sofa? I want to submit the floor plan of my apartment i really dunno where to put appliances with that kitchen. Thanks! Hi again! This was my message: Can I put my fridge beside the sofa? Or put my tiny dining table behind the sofa? I want to submit the floor plan of my apartment i really dunno where to put appliances with that kitchen. Thanks! I have a nice sized LR with a powder blue barrel-shaped leather swivel rocker, a medium- (3 cushion) and a smaller- (2 cushion) sized navy blue leather couches and a large navy blue footstool, also leather. I also have 2 more swivel rockers, very comfortable and in great condition but that need recovering. The only fabric I really like is from thousands of online fabric’s photo’s & about 75 swatches, is a black background, heavy tapestry (50,000 DR’s) with a raised, shiny gold botanical design. These two chairs are up against a big bay window looking out over farm fields. My concern is (1) the fabric has that black background & and I already have 3 Nauzzi leather pieces of dark navy, (2) I have no gold in the LR but yes some silver & gray here and there, (3) no blues and no rose color in the fabric (rose is in the frame of a painting, and the subject of another). Can I get away bringing in this black/gold fabric? I could paint my coffee table and end tables satin black and they already have gold trim. Would that help or would it make the whole LR look like a mauseleum? Heavens. We need help picking out a rug! Our living room design inspiration was “jewel tones”. The floors are almost black faux wood. The TV stand is a dark aqua color (much darker than the website photo). The couch is a “platinum” grey color. We wanted to paint an accent wall behind the couch in a magenta/berry/plum color. But we are also open to blues. Right now we’re struggling to select a rug. What tips are there for selecting a color? Our couch is is neutral, on the brown side. We have pillows that are mainly ivory with a leaf pattern consisting of brown and sort of a charcoal. The room is neutral too, flooring and walls. I want to bring in color, possibly shades of blue. What color draperies would you suggest? I am painting my dining room a light gray and I have two accent chairs that are beige with gray and yellow flowers. My table is an espresso color with marble top, but I cannot seem to decide on whether to do a solid or print rug and same with curtains. Also, I have two accent chairs for my living room that are a mauve color with plum, lilac, and ivory flowers. My sectional is brown and I am trying to decide on a rug for that room as well, along with the color of wood on the accent tables. I was planning to paint the room mauve that matches the chairs and maybe have an accent wall. Kitchen decorating question: we are trying to decide the color and style of our cabinet pulls. Countertops & appliances are white, sink and faucet stainless/nickel, light fixtures oil rubbed bronze and cabinets are an dark oak brown. I had originally thought we would use oil rubbed bronze pulls but then began looking at nickel. Would it be okay to use nickel cabinet pulls or would that call out the fact we don’t have stainless appliances (which is apparently a bad thing when looking at kitchen value)? I have a den that is 17′ 5″ x 22’4″. The problem is I have two double windows on each side of the long walls and 2 3′ doors. on the shorter walls I have 2 3″ Doors on the other walls and one of those walls have a 6′ opening. If you are looking at the room there is very little wall space. I need to know how to arrange my den furniture. The focal point is the TV and there are so many doors and windows in there that I have to allow walking space in the room. HELP! I am looking to put hardwood flooring in upstairs. The new hardwood would meet my existing hardwood stairs which are 3″ yellow oak. I would like to use a medium brown and maybe 4″ planks. Would that look good or do I need to stay with the same wood? Can you paint wooden window frames one colour inside, and another colour outside (i.e. eucalyptus green on the outside and light grey on the inside)? If so, how would you you do it? … and is it common practice to do this? We live in a tiny 600 sq ft condo. Our windows face south west and are surrounded by giant old growth evergreens. They cast a greenish reflection into the living room. The floors are light honey yellow bamboo. Unfortunately this combination makes my gorgeous white sectional look a yucky creamy green color. What color do you suggest I paint in order to neutralize the green and make my sofa look white again? My livingroom, dining area and kitchen are one long narrow space. My counters are black granite, splash and fireplace surround are green sea glass. My area rug reminds me of the stones on our local beaches; shades of taupes and grays.. My wooden pieces are dark as are the kitchen cabinets.. Our taste is west coast modern, sleek and clean. Phew… that’s lots of info! Thanks for your assistance. I put off painting because I don’t know what color will solve my problem. I have a formal dining room set (table, 10 chairs, hutch) that I really love. It’s a Tuscan style with warm, honey-toned wood, and rich red and green upholstery, which go together nicely. But I want to update my color scheme a bit and go with grays and teals. How do I pull this off? I’m afraid the cool tones of my new colors will clash with the warm tones of my wood. The set is too expensive to replace! I am having grommet curtains made for bedroom windows that are 67.5 inches wide. The grommet diameter will be 1.56 inches for each grommet. I am trying to determine which size diameter curtain rod would be best in this situation. My options are a 3/4 inch diameter rod and a 1.25 inch diameter rod. Suggestions? What do I hang on a large wall with a cowhide? I recently had a pipe burst in my living and dining room. Almost all of my furniture was ruined. I am buying a new living room set and had some questions. First my walls are painted hopsack brown in the lr and nomadic desert in the dining room. The dining room furniture is a light to medium oak like a sunburst with white cloth upholstery and beveled darker glass. The adjacent room is the livingroom which I was thinking a graphite gray couch and recliner with a med oak coffee table with slate pieces on top that match my entryway and a small secondary table with black metal legs. Questions are curtains for both rooms? Four windows two in the dr. Area rug? Lamps? Entertainment console color/ material? Also I have a large entry way with slate the wall color is a light seafood on the right wall and the cream on the left wall. I think my style is a cottage chic, modern, simple, earth tones ect. The layout of my livingroom is difficult. Walk through the entry to a long wall on the right leafing to two windows and a fireplace, left wall two opens kitchen and dining with a small corner where the cable is located. Also I was thinking accent items and pillows, also Maybe bamboo shades with curtains and two tones in kitchen maybe beige and green and all green in living room. I am very new two this so I am sorry if my post is lacking. If any additional information is needed please let me know whatever will help. I don’t think I want everything wood so I was thinking something different for the tv consoles so any ideas on that would be greatly appreciated thank you. Oh brown carpet. One more thing I wanted to do little frames through out the house with routines or quotes any suggestions on that? I like to have the rooms flow together. The long hallway front entrance to my Santa Fe style home has a large rectangular recessed wall niche (9.5′ long by 5/2″ tall). The ledge is very shallow (about 3″, so … with cats (or without) … it’s not adequate for housing any kind of candelabra, plants or statuary. Perhaps what’s worse, is most of the interior of the home has been painted a mustard yellow color. The inside of this art niche is off-white. What to do with this large and imposing shape? Thank you so much for sharing insights and ideas! We recently purchased a home (small bungalow) with oak kitchen cabinets, we are looking at knocking down a wall and making the main floor open concept. We don’t have a huge budget so I was thinking laminate floors but not sure what colour floor would go with oak cabinets? Also what colour to do walls? Have a question about how to decorate your home? Comment on our Ask a Decorator form and one of our home improvement pros will offer some insight! Want a Career in Decorating?